Last night’s The Vampire Diaries “What Are You?” brings up some very important questions regarding our favorite Mystic Falls residents, the most important one being who are they really? After last week’s devastating cliffhanger, Bonnie isn’t doing well after losing the love of her life to a crazed Stefan. But is Enzo really gone? No one on this show is ever really gone (just look at who shows up at the end of this weeks) and Bonnie hearing Enzo call out to her over a pot of boiling water shows just that. Since she won’t answer her phone, and who blames her really, Bonnie’s long lost mother appears to help her move on only things don’t go exactly as planned. When they were trying to reach out to Enzo, all Bonnie’s mother saw was the moment of his death and the blast of energy that came out of Bonnie which freaks her out enough to burn Enzo’s corpse much to Bonnie’s disapproval. Why? Because when Enzo died Bonnie reached into a darkness she never even realized she had, and if she tried to pull Enzo out, she would just get sucked into that darkness with him. So will Enzo come back? I think he will. With the amount of seriously bad stuff that always happens to our poor witch, I can’t see the writers giving her a sad ending while everyone else seems to be barreling to happy endings full of redemption. Stefan is on the other side of the fallout of Enzo’s death. Paul Wesley does a fantastic job of playing the shell-shocked newly turned human Stefan. What he did was bad, probably some of the worst killing and all around nasty stuff that any character has done on this show, so Stefan can’t just move on. In fact, he probably never will despite Caroline refusing to give up on him. I can’t even feel bad for him at this point and thought it was pretty hilarious that he was pulled over and arrested for speeding out of all things. Of course once he’s at the station the police connect him to all the gruesome murders, but Caroline shows up to save the day and compels him out of trouble. There’s a moment for redemption for Stefan in the form of a little girl at the police station whose mother, the woman who sold Bonnie the house that Stefan sank his teeth into, is missing. Caroline and Stefan race against the clock to save the woman while Damon is on a race of his own. Cade has arrived and is prepared to let the brothers out of their deal, the catch is that Stefan will have to die by midnight if Damon doesn’t deliver a Maxwell family book to him that has the recipe for killing Cade. Said book is currently with Alaric, Matt and Dorian who are studying it and trying to figure out what the hell is wrong with Matt, who at the beginning of the episode woke up in Alaric’s house covered in blood. Damon doesn’t have time for Alaric’s psychic experiment on Matt though, and ends up stealing the book while everyone is distracted by Matt’s tale of his ancestor making the bell and the witches that were killed trying to save Mystic Falls from hellfire hundreds of years ago. Hilariously Matt’s ancestor looks exactly like Matt, and I hope that every one of Matt’s ancestors will be played by Zach because it’s pretty funny to think that Matt has spanned the ages of time. The episode concludes with Stefan, who is recovering from a sad wound after the real estate woman freaked out and stabbed him when he was trying to save her, getting tasered by a mysterious figure outside of Bonnie’s house. 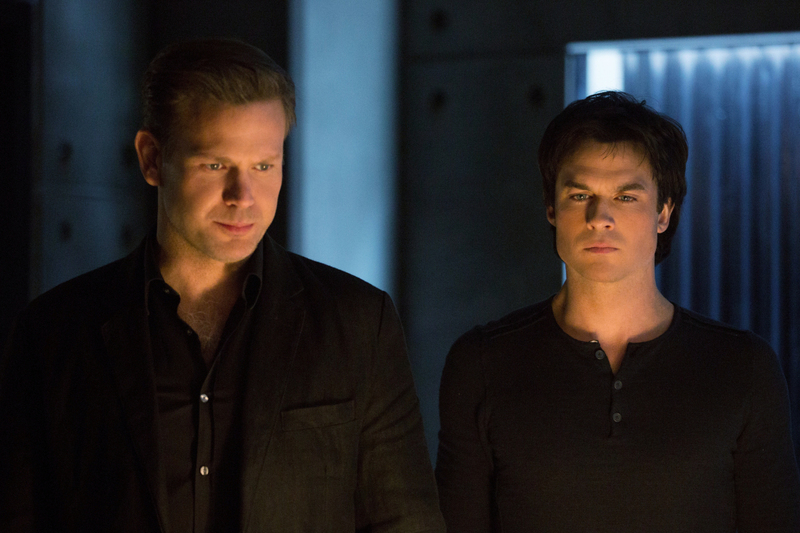 Damon meanwhile is explaining to Alaric that he knows how to destroy Cade (because he read the book before giving it to him), but someone else has a better plan. Kai – literally comes out of nowhere! Since Kai is back, that basically means that Elena’s going to be waking up sooner than we thought. Maybe even next week? The Vampire Diaries airs Friday nights on The CW. Previous ArticleTV Review: Supernatural 12x11 "Regarding Dean"
Next ArticleWhy "The Batman" Should Be "All-Star Batman"